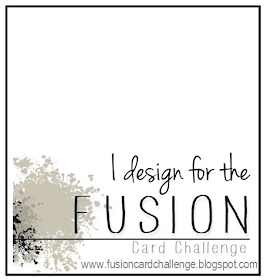 If you're hanging around too, check out the Fusion Challenge blog site. 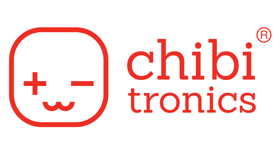 We are announcing the new Design Team, and you will not believe the amount of talented ladies we have! It's really going to be a place you'll want to stop by, both for inspiration and to play. Speaking of inspiration, how cool is this wall? 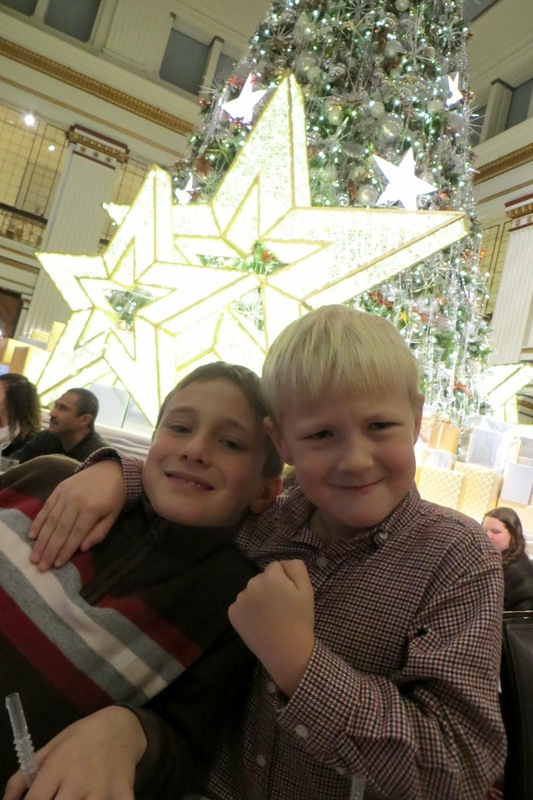 We had lunch at Macy's Walnut Room downtown Chicago on Christmas Eve. The wait for a table was 2 hours, but it has definitely been worse (I've heard 4-5 hours on the weekends before Christmas). Since I had time to kill, we went back to this awesome wall I saw in the furniture department to take a few pictures. While I was fixing the settings on my camera, the kids got out their video games. Love this way better than a posed picture! 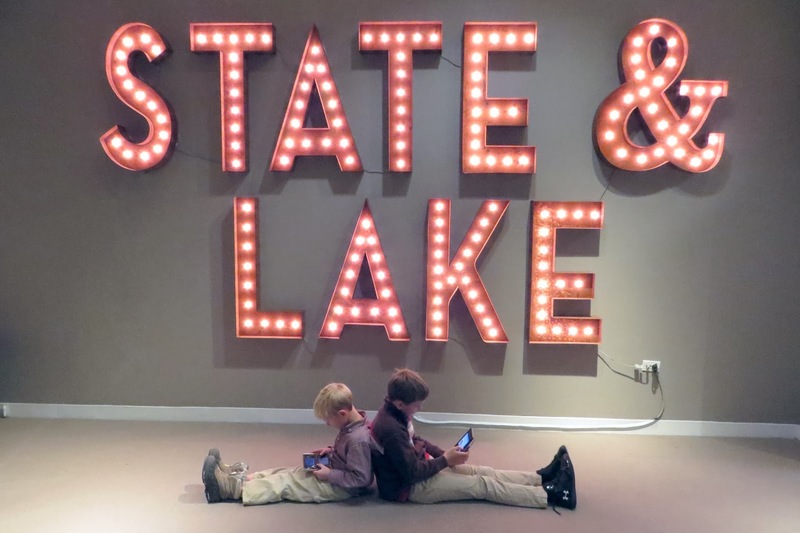 State & Lake is the intersection of their store. An Idea for Next Year's Christmas Cards ... What Do You Think? 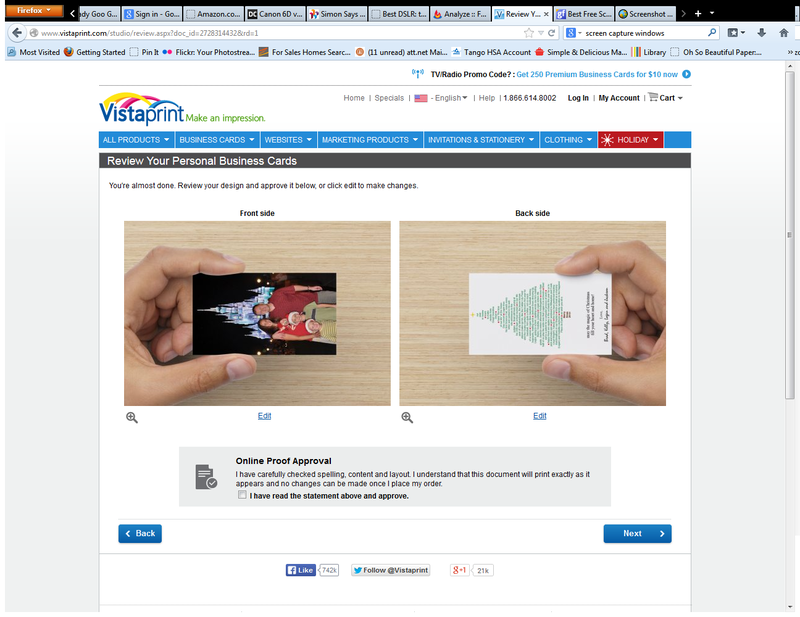 Just got an email advertising 250 business cards for $10 and it hit me ... next year's Christmas card!! The whole photo Christmas card thing has been perplexing me this year. I absolutely love the Tiny Prints and Minted cards. Every one of them I receive ends up on the side of my refrigerator. The thickness really does it for me. And the super matte finish of the photos. I thought so hard about how to get that for my Christmas cards this year, but the thing is, paper that thick doesn't work in most printers. I'd have to get them printed somewhere, and after paying for that I might as well have just ordered from Tiny Prints in the first place. Soooo ... I'm hoping the thick business cards just might do the trick. What do you think? The tiny size would be a novelty. 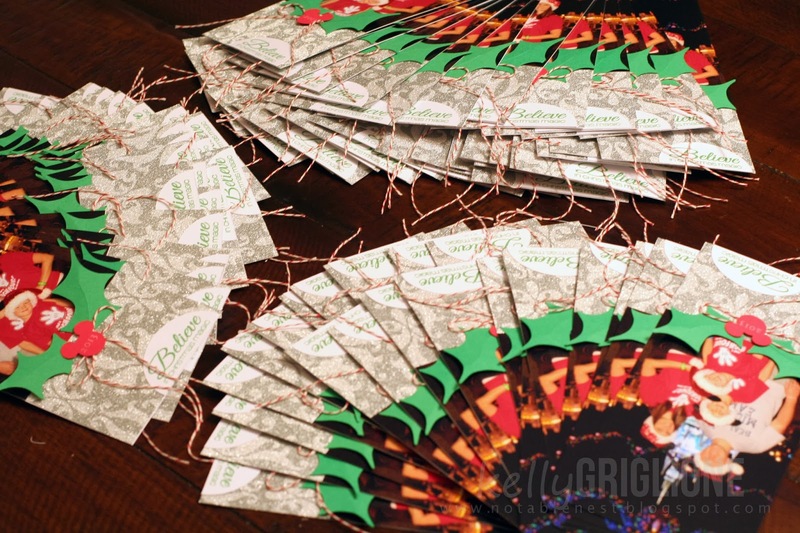 I could make a library card pocket out of Christmas paper to slide them into. 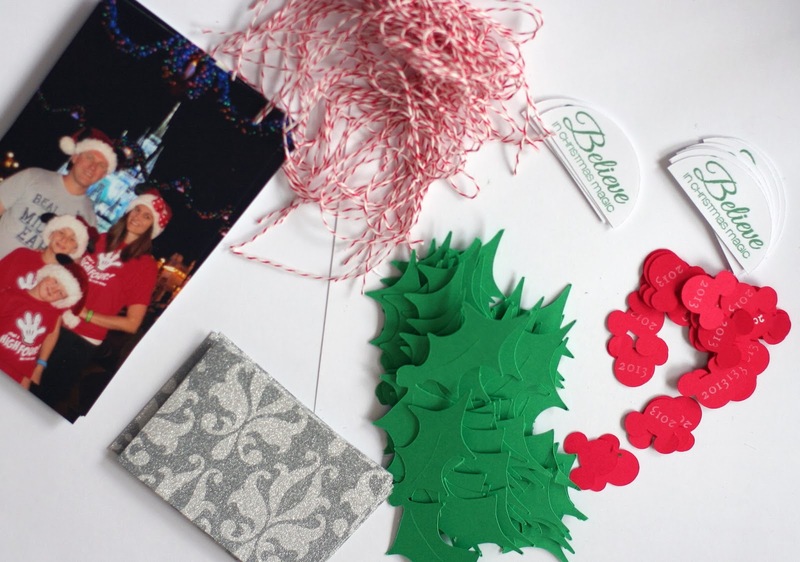 Or, punch a hole through the top of the business card and use some cute ribbon to make them into an ornament. The photo above is what my 2013 Christmas cards would have looked like in a business card size. I think I'm going to try it! PS. I just put all of my posts for the next month in draft ... I'm going to warn you, there are quite a LOT of them. Especially for a non-daily blogger like me. Tons of fun and exciting things coming up!! 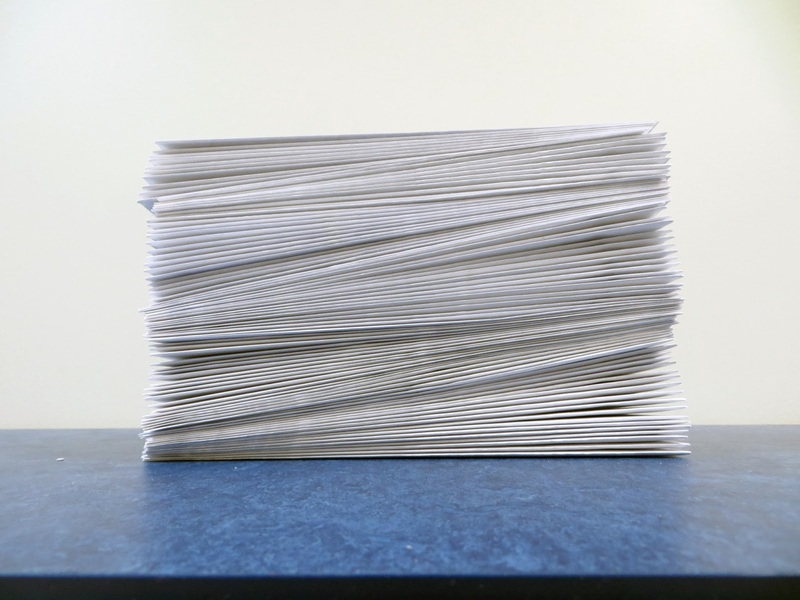 There truly is no greater sight than seeing your Christmas cards DONE and piled high at the post office, ready to be mailed. 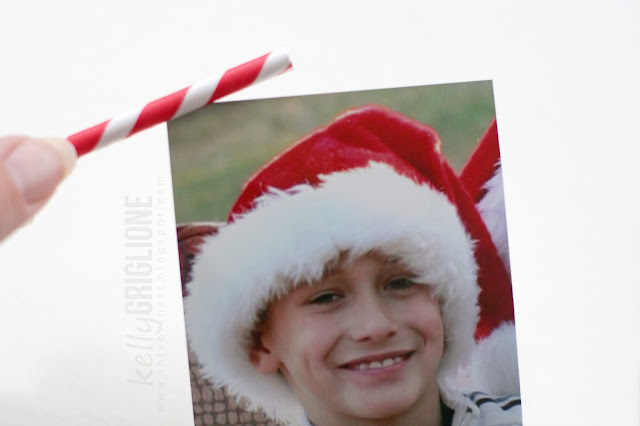 My 2013 Christmas Cards are over at the CAS-ual Fridays Stamps blog today. I used the sentiment from Christmas Carols. My Silhouette was used a lot for these cards: holly leaves (modified from a clip art image), berries (did you notice they are Mickey Ears to go along with the theme?!? I impressed myself with that one! ), and the half oval which was custom drawn to fit the sentiment. Here are the parts, after I am almost done. It was good to see those piles get lower and lower. The paper is American Crafts Damask Glitter. A pack of 20 pages retails for $39 on their site. I was beyond ecstatic to find it at Tuesday Morning this summer for only $3. Score! My sweet friend Sarah came over to rescue me. I really didn't think I was going to make it in time. 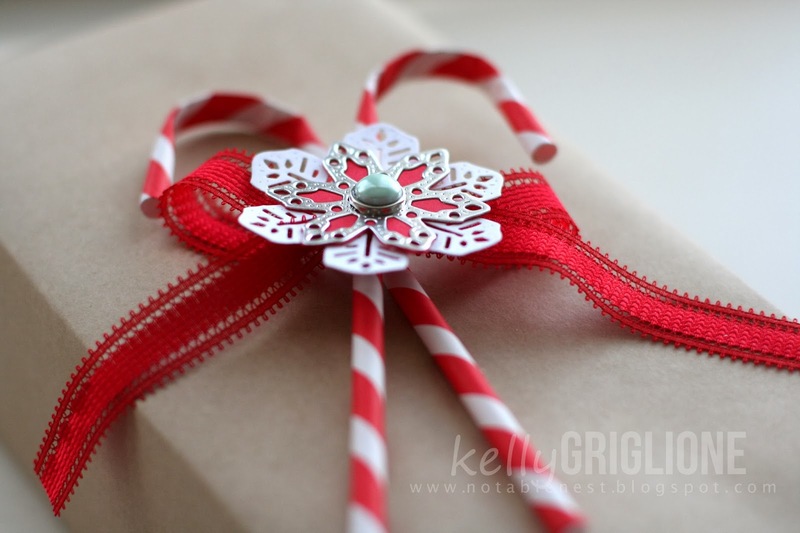 She tied all the baker's twine bows, stamped some sentiments and return addresses. She doesn't spend much time crafting anymore, but she is even more detailed than I so I totally trust her! Hopefully she's free next year ... we had a fun time chatting and then going out to lunch afterwards. It's always misleading when I finish the cards, because to me it feels like the work is done. I always forget the time it takes to put them all in envelopes. 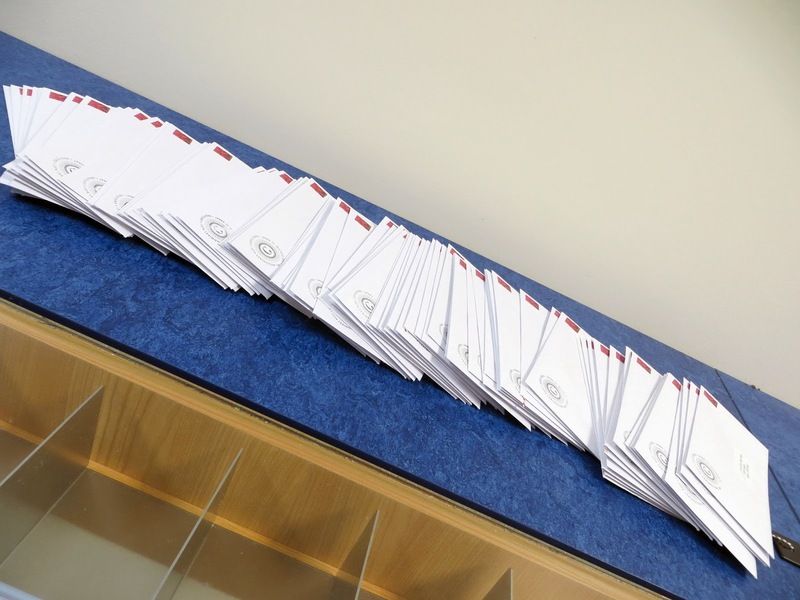 And here they are, in envelopes. All 98 of 'em. To the right of this picture would be the policeman who laughed at the crazy lady taking pictures of envelopes in a post office. Thanks for looking, and have a Happy New Year's Eve! Guesting on Moxie Fab World (EEK)! ... oh I was in heaven! 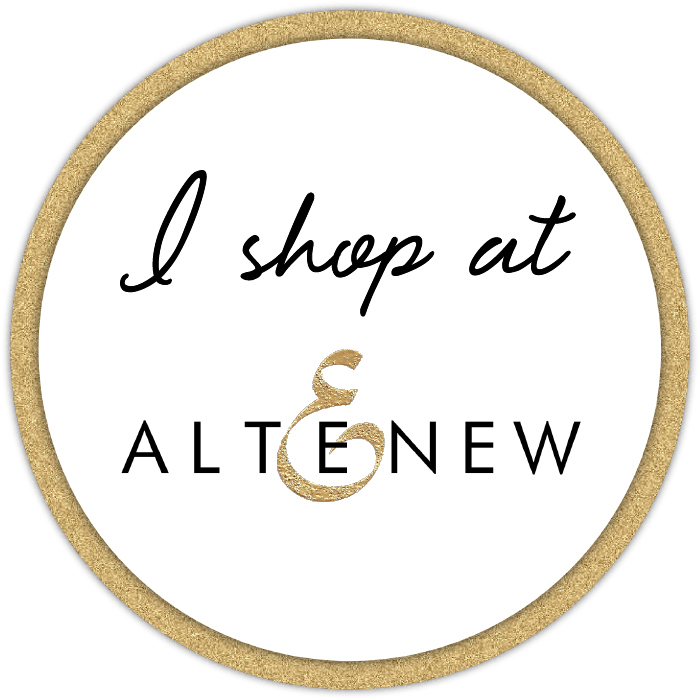 If there's a TJ Maxx or Homegoods store near you, be sure to check it out. Let's see your New Years projects! It's time for a countdown of the crafting variety ... count down the minutes it takes to complete your New Year's project. If you can do it in 10 minutes or less, you can play at 10 Minute Craft Dash too. 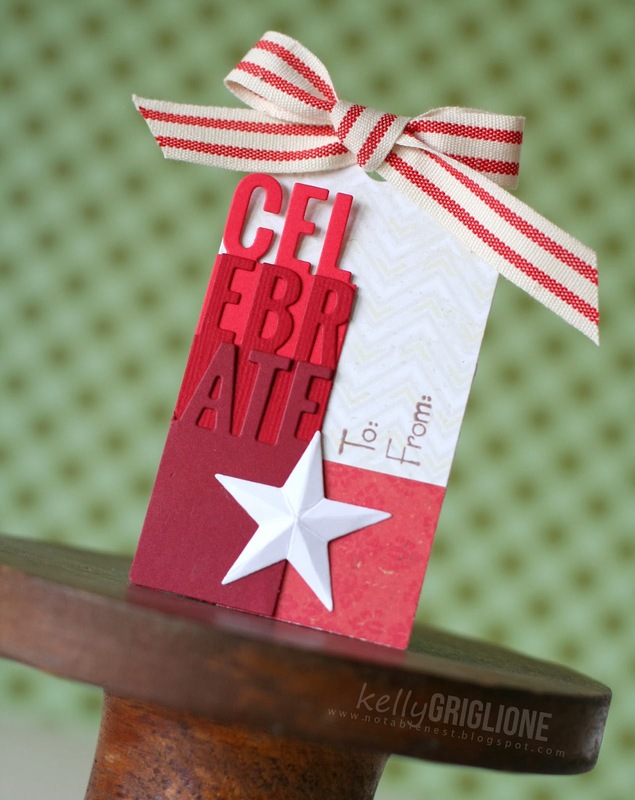 The talented winner of this two week challenge will receive a prize from CAS-ual Fridays Stamps! I knew this before, but I am just NOT a 10 minute crafter. At all. Period. My first attempt took 30+ minutes, and it was down-right laughable. I took a picture of it to give you a "before and after" view, but after photo editing I didn't even bother to save it. It is that bad. Trying not to get discouraged, I made this card in a little over 8 minutes. It doesn't say "Happy New Year" because I don't send any of those cards out, but it does have a message in that same spirit of new beginnings. 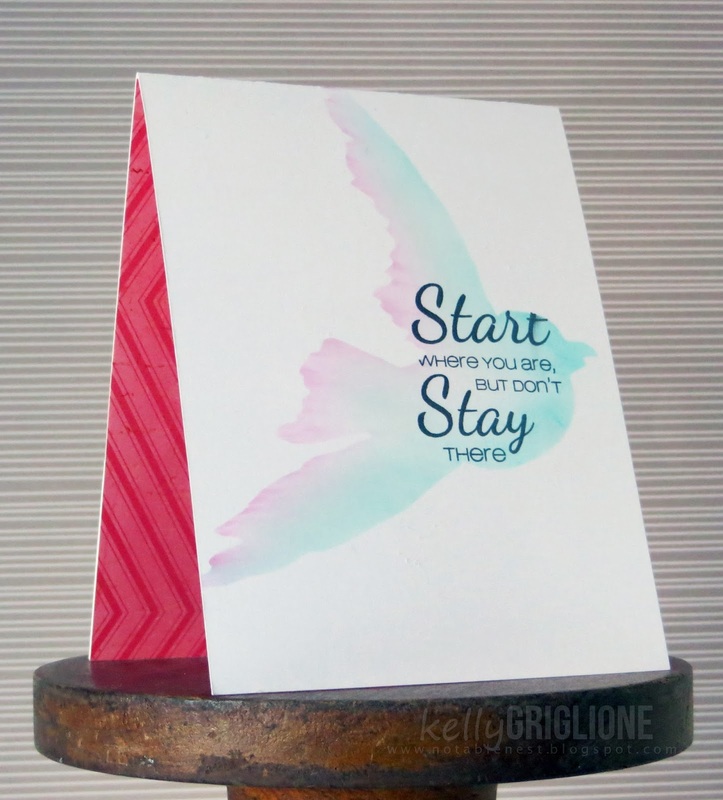 I used the negative portion of the dove sticker I had on my first card as a stencil. On the raspberry sponging I let my fingernail put additional pressure onto the card to get those darker lines that reminds me of feathers. The sentiment is from CAS-ual Fridays Breathe. 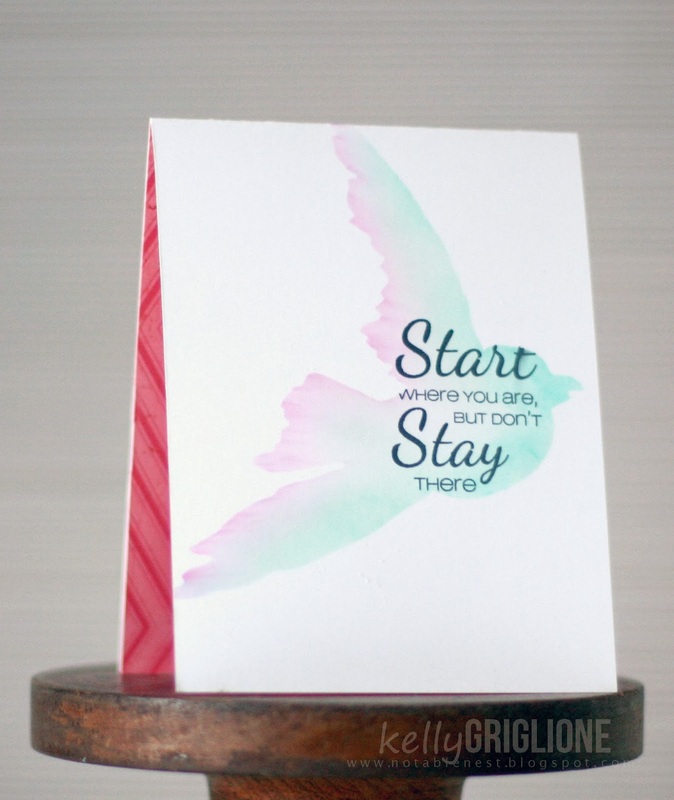 Bird sticker is from Heidi Swapp, and the interior cardstock is American Crafts. Can't wait to see your stitched creations in the CAS-ual Fridays Challenge gallery! Remember to also link it up to 10 Minute Craft Dash if you can get it done that quickly. This week's challenge is to use snowflakes or some kind of snow in your Clean and Simple creation. This challenge has a shorter window and will be ending at midnight on Wednesday, so don't delay! Our sponsor is Simon Says Stamp, and the talented winner will win a $25 gift certificate! I'm still in love with those paper straws. I've got about a hundred left over after finishing a couple projects, including the quickest Christmas ornaments ever. 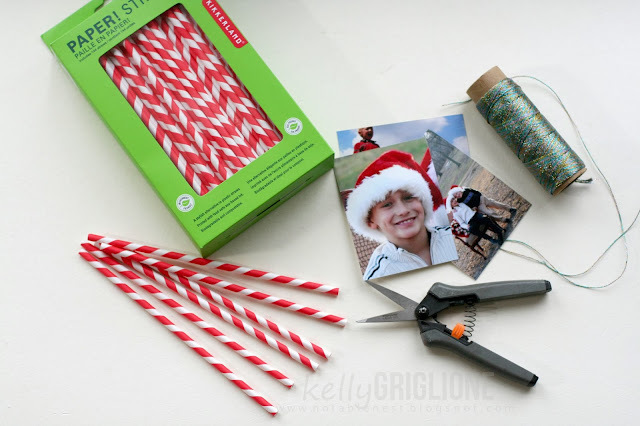 After seeing the straws used as ornament hangers online, I thought I could bend them into a candy cane shape. They keep their shape somewhat, but to help them out a little I slid a wire inside that I could bend. The snowflakes are the Snowflake Trio Die Set from Top Dog Dies. I've layered two of them here, with the top one cut in silver foil paper. 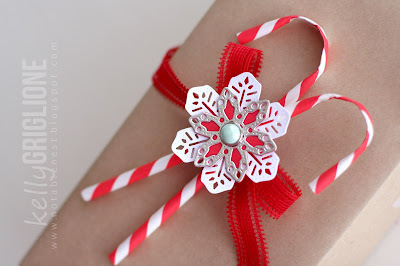 To make the design of the top snowflake stand out a little more, I backed it with another snowflake cut out of red and kept the middle pieces intact. The pearl, silver-edged brad is by American Crafts. This was quick to put together, and would be a good candidate for mass-producing as a gift topper, tag, or ornament. Can't wait to see your snowflake creations in the CAS-ual Fridays Challenge gallery! Thanks so much for looking! 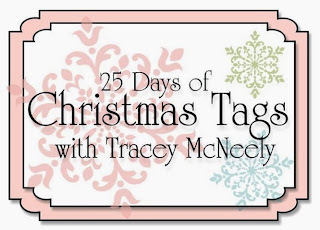 I was so happy Tracey McNeely asked me to take part in her 25 Days of Christmas Tags special. I've enjoyed reading her tag series, which is now in its THIRD year! Tracey is the sweetest crafter around, always leaving encouragement for everyone. 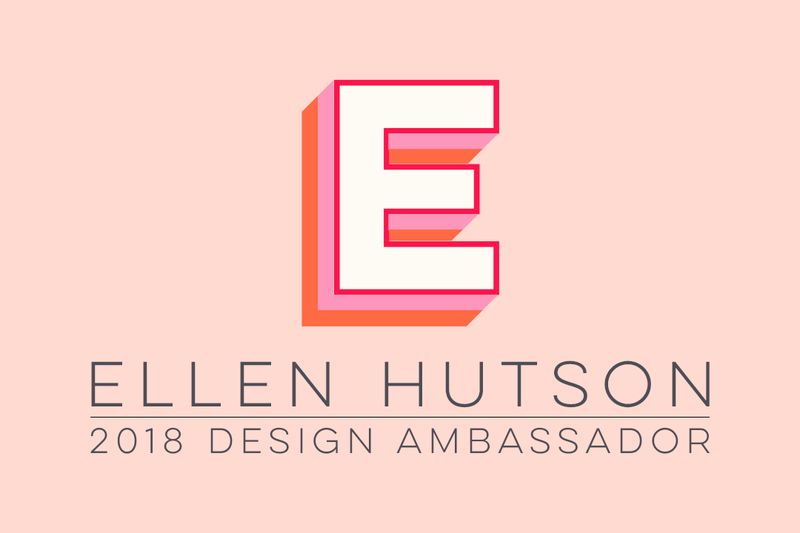 I seriously don't know how she does it all, especially since she's on a million design teams. Its been a real delight to know her better over the years. I just got the MFT Die Namics Accent It Celebrate word dies (Thanks Helen!!) and totally fell in love. 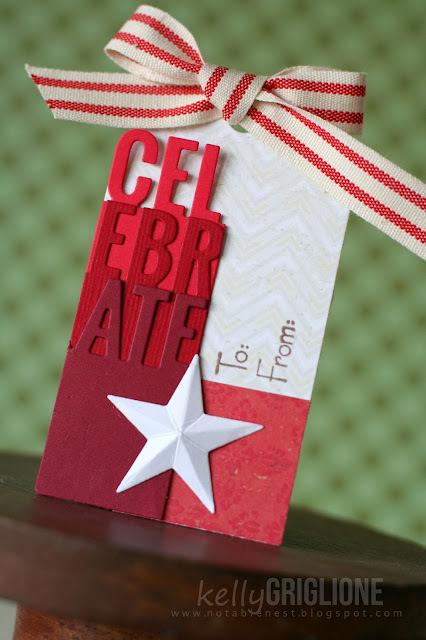 There are so many different ways I could use "celebrate" for this tag, but I ended up dividing it into thirds and loosely layering the letters. EEEK! Paper Source! I've been waiting for it to open for many months now, and on American Black Friday I finally got my chance. It is literally 3 minutes from my house. A tad closer than Michael's. I know, crazy! Paper Source started out being a high-quality stamping/paper/stationary store downtown Chicago, and apparently has branched out to 40+ locations now, mostly around LA, New York and Chicago. I couldn't resist. While getting the Paper Source photo, this photo was right next to it. We saw the wonderful Disney movie Frozen and this is my youngest getting out of the theater with his 3D glasses and hat. He wore that take-out container (unused) on his head for most of the day. 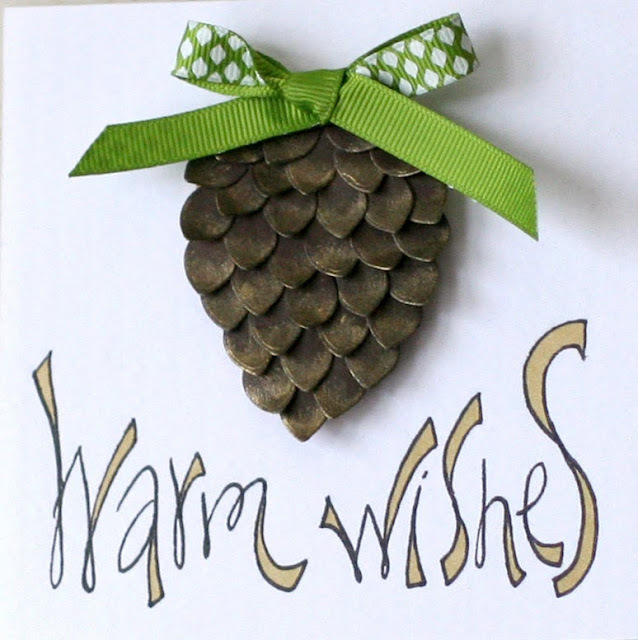 So far, we've got a wreath and a tree, now it's time for a pine cone ... all made with the CAS-ual Fridays 4 petal die. 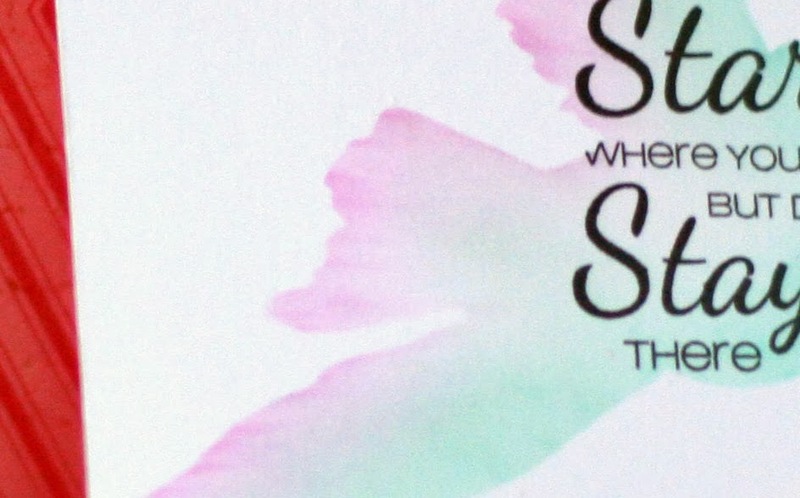 Like the other projects, this is made by simply tearing apart the petals from the 4 petal die and placing them individually on a sturdy surface (I used chipboard covered with adhesive). 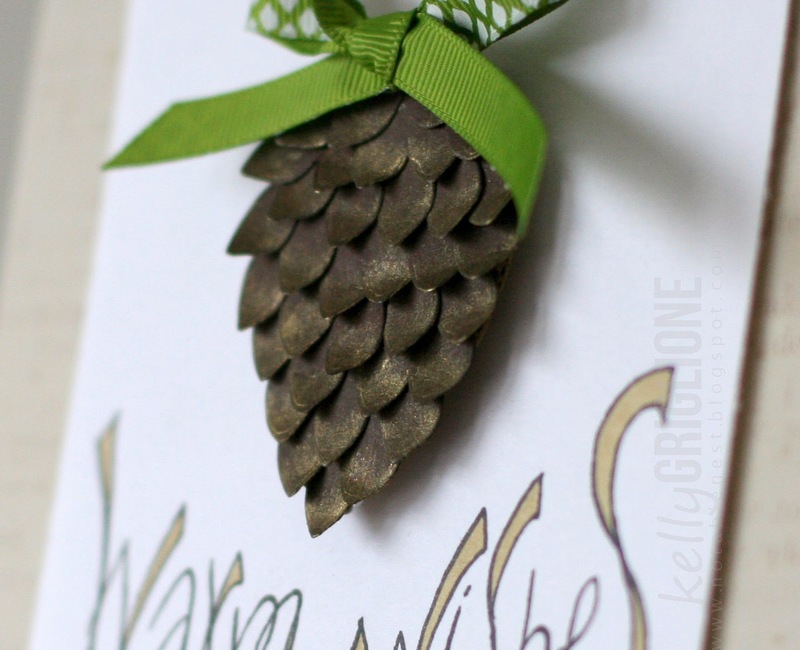 I found that angling the petals inward by the tip of the pine cone, and outward by the base of the pine cone gave the most realistic appearance. The "petals" all are bent and brushed with gold metallic ink, which makes them look even more dimensional since the light hits them at all different angles. I know I've said this a lot, but since it's an open die, there's an extra ridge that is created. 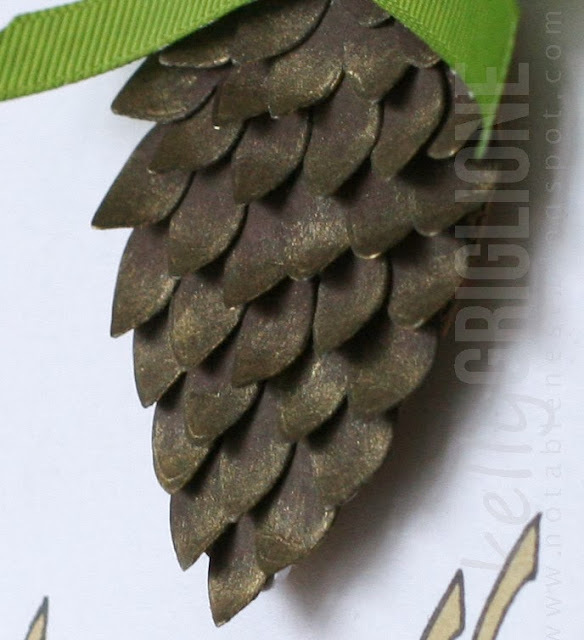 With the gold ink brushed on top, it really highlights that feature, just like a real pine cone. I hand-drew the sentiment and colored the letters in with alcohol markers. 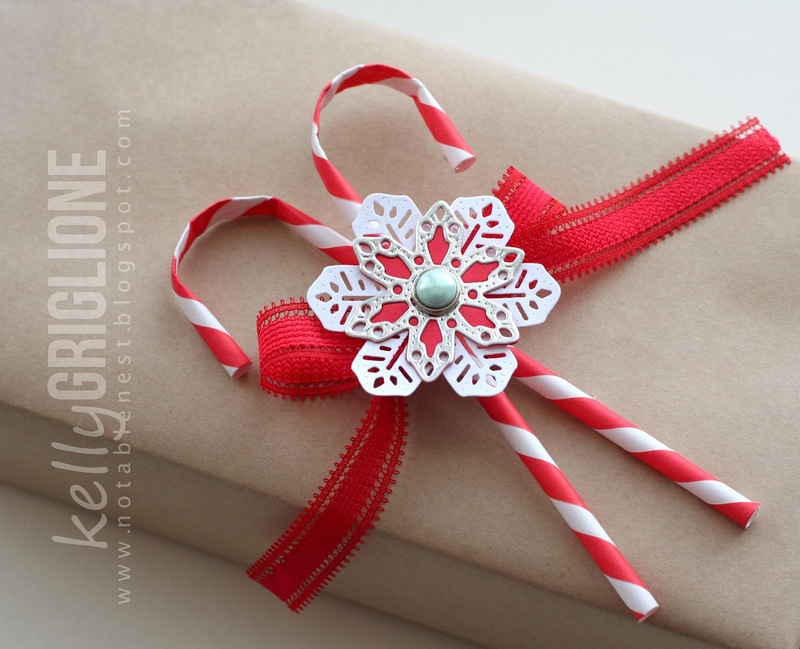 Double sided paper is from The Paper Company; printed ribbon from American Crafts. I think this is my favorite 4 petal creation yet (out of 3 that's not really saying much, but I do really like how it turned out!) 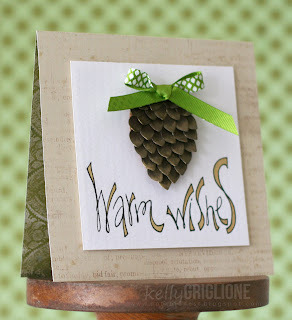 This card is also over at the CAS-ual Fridays Stamps blog today. 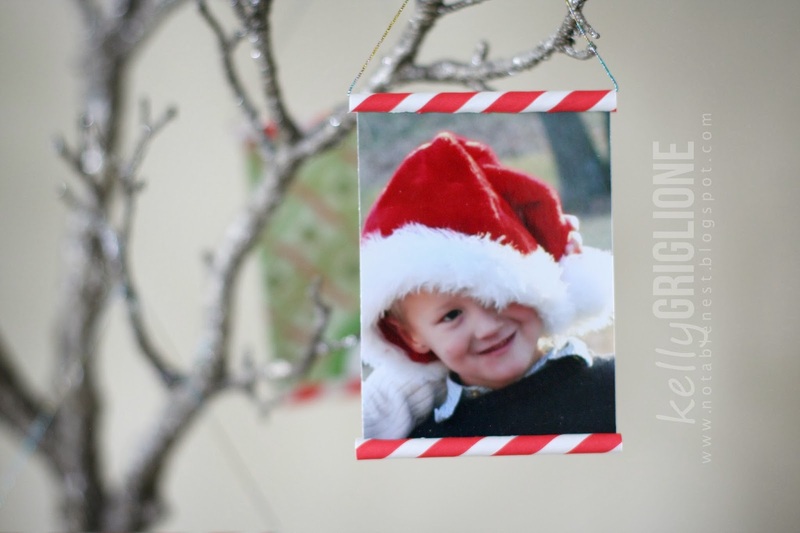 Quick, Inexpensive, Cute Ornaments in Minutes! I'm so excited to be guest posting on See Vanessa Craft, showing you the quickest and easiest Christmas ornament project EVER! 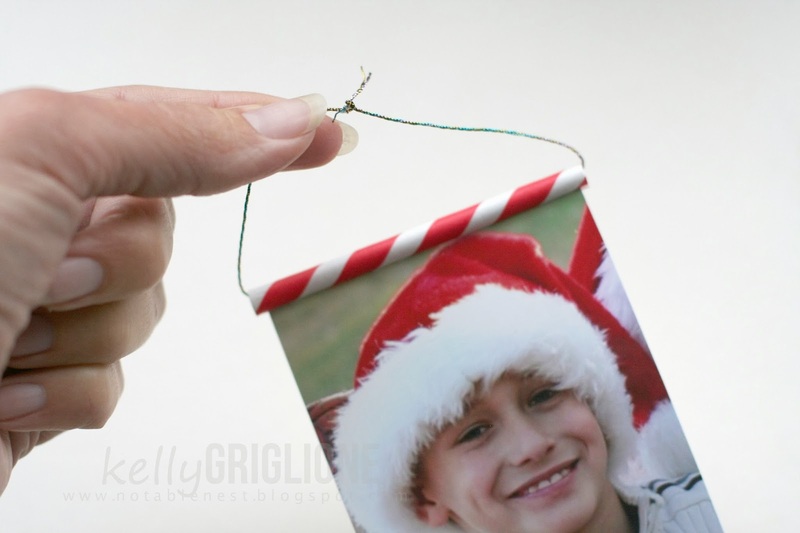 It would seriously take you longer to stand in line and buy an ornament than to make this one. And it uses one of the hottest entertaining trends of 2013 ... the paper straw! 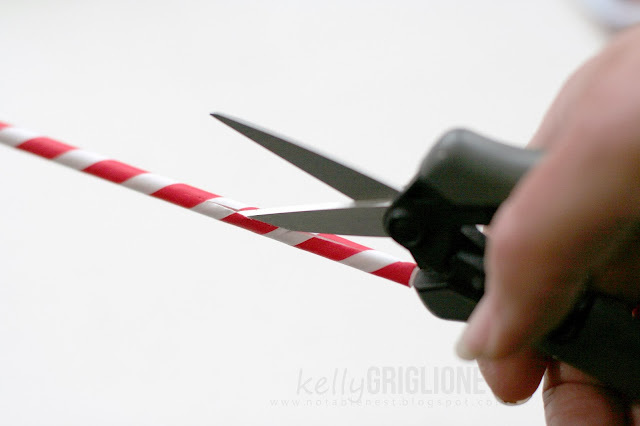 1) Cut lengthwise down the paper straw. 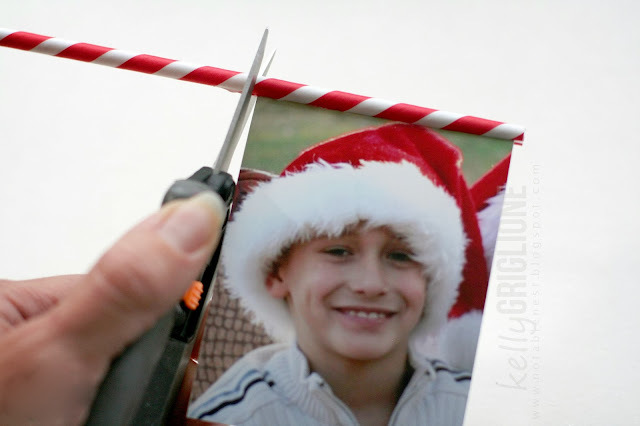 2) Slide the photo into the slit you just made in the straw. 3) Cut straw to size, and repeat for the bottom of the photo. 4) Run thread through the top straw for the ornament hanger. 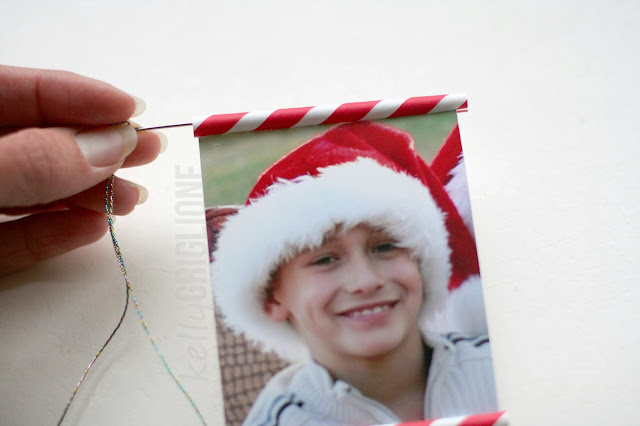 6) Use a small piece of tape to adhere the straw to the photo in the back. 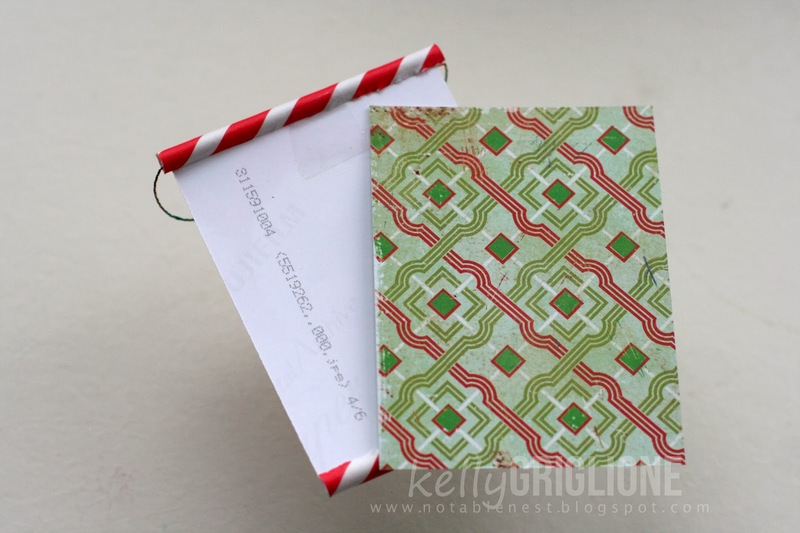 Cover with patterned paper. 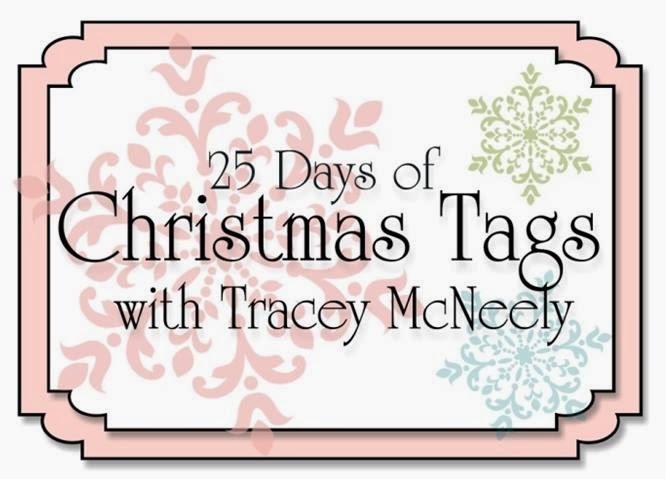 7) BONUS STEP: add a date and name on the back. 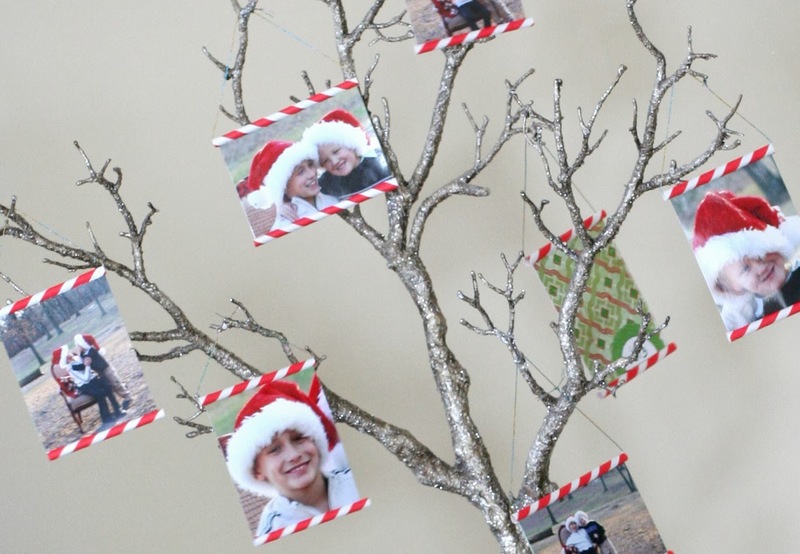 Wouldn't this be a neat tradition to have a photo from each year for your child? Or for couples on each anniversary? Or entire families? Or even using your Christmas card photo? 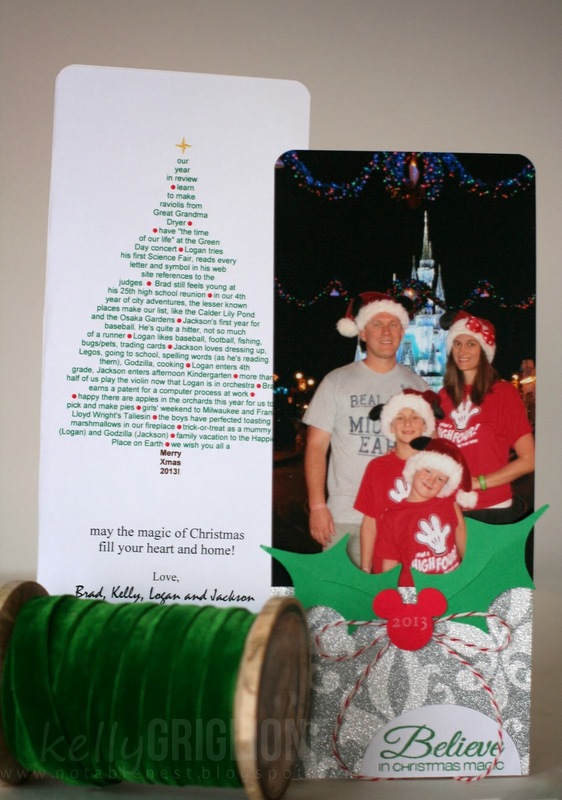 What about using the Christmas card photos you receive in the mail and just cut off the sentiment portion? 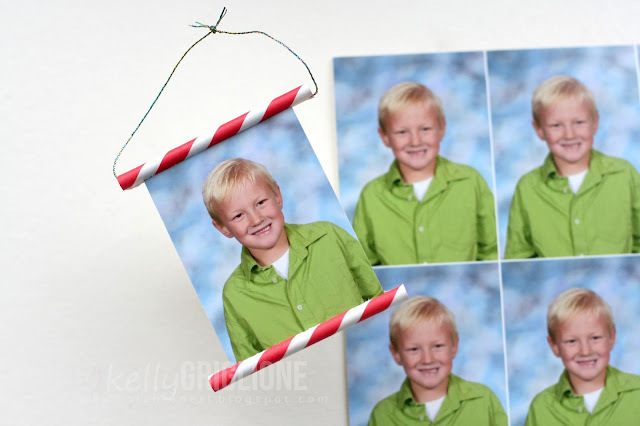 Yet another idea is to use extra school photos - either for your own tree, or to pass out to friends and relatives. This is a perfect craft to outsource. Put your kids to work and have them do the assembly. It's really hard to mess this one up! 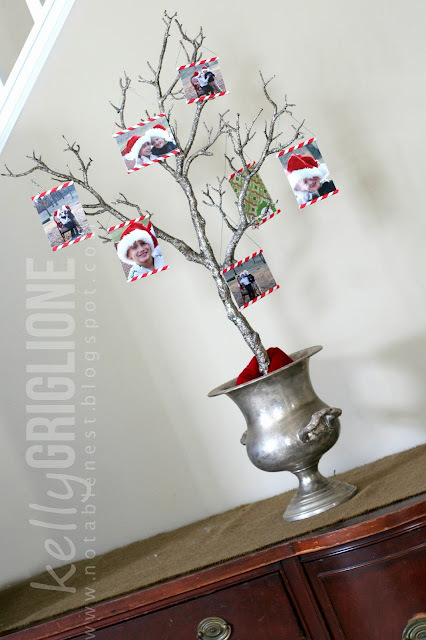 I used photos from our Christmas card photo shoot, and have them hanging on their own tree in the foyer. It's a great conversation-starter for guests who drop by. 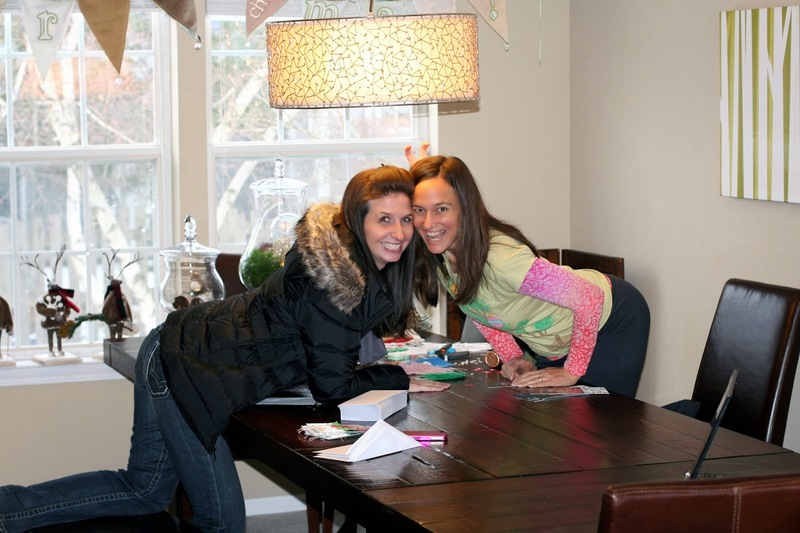 Many thanks to Vanessa for inviting me to be part of her 20 Crafty Days of Christmas! I always love the awesome projects she shares on her blog.